Famous for its youth protection laws, Germany is relaxing its stance on Nazi iconography within video games. Trade body Game has said that USK, the region's rating body, will be able to assess titles containing such imagery "effective immediately". There are a few stipulations about the use of such iconography - they have to be serving some kind of artistic or scientific purpose, or be part of a depiction of current or historical events. This puts video games on the same cultural level as other artistic mediums in the region. "This new decision is an important step for games in Germany," said Game MD Felix Falk. "We have long campaigned for games to finally be permitted to play an equal role in social discourse, without exception. "Computer and video games have been recognised as a cultural medium for many years now, and this latest decision consistently cements that recognition in terms of the use of unconstitutional symbols as well. "We in the games industry are concerned about the tendencies we see towards racism, antisemitism and discrimination. We are strongly committed to an open, inclusive society, to the values laid out in the German constitution, and to Germany's historical responsibility." In the past, games such as Wolfenstein have had to change Nazi symbols in order to be released in Germany. 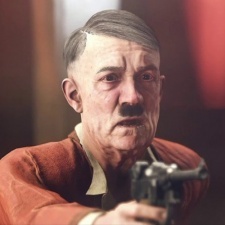 Bethesda even changed Hitler to not have a moustache in last year's The New Colossus. Though we're sure the relevant authorities know much more about this than we do, we do have to question the choice to allow Nazi iconography in video games as far right wing views sweep over Europe and America. There is a very, very good reason why Germany has some of the world's most stringent youth.